If you are looking to buy a new build property, a modern new build apartment or maybe a brand new villa – off plan property or key ready property on the Costa Blanca, New Spanish Properties can help you…We have access to all the very best brand new property options currently on the market. The Costa Blanca, on the South East coast of Spain, is a favourite destination with Spanish and Western European holidaymakers alike, with many choosing to buy a new modern holiday home in Spain here. The Spanish property market is thriving across the whole of the Costa Blanca, South & North and with exceptional property prices there has never been a better time to buy a brand new property for sale in Spain. With over 300 days of sunshine a year and an average temperature of 20°C, the climate here on the Costa Blanca is fantastic and really something to consider when looking for a new build property to buy in Spain as you can easily holiday or live here all year round. You only need to cast your eye across the farmers' fields to see them blooming with fruit and vegetables four times a year! With no heavy industry in the area it is also a very healthy, dry climate. The salt lagoons situated 2 kms from Torrevieja, Costa Blanca draw the moisture from the air, making the climate ideal for people with arthritis, psoriasis and asthma. In fact the health benefits are so significant the World Health Organisation recommend the Costa Blanca one of the healthiest places to live. The Costa Blanca, Spain is divided into the North and South regions, as a guide Alicante can be considered the dividing line. We have a vast selection of new build property for sale on the Costa Blanca offering something for everyone. New Modern apartments for sale and a vast collection of brand new villas for sale. If you are looking to buy a new build property off plan or key ready on the Costa Blanca our team can help you find the perfect property. The Northern Costa Blanca is a less developed area with regard to buildings and tourism in comparison to the Southern Costa Blanca. The towns of Moraira, Javea and Denia are in a strict conservation zone where building heights and density are rigorously controlled to ensure the picturesque coastline and dramatic mountain range views are not compromised. However over the last 12 months we have seen many exceptional new build villa developments launched for sale all over the Costa Blanca North. 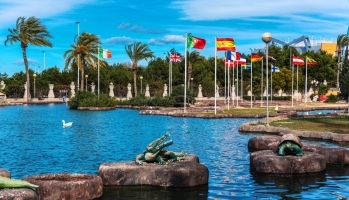 Alicante, a historic Mediterranean port, dating back to the fourth century, is now one of the fastest-growing towns in Spain with an equally growing property market. The wide harbour and castle dominates the centre of the city which is littered with wide alleys and a central shopping area perfect for strolling. Sun lovers will be spoilt for choice as they ponder the several kilometres of beaches along the coast. The Southern Costa Blanca area from Alicante is a region that is very easy on the eye. The contrasting gentle landscapes and rugged coastline play host to Spanish life, whether you are looking for quaint, traditional Spanish villages or bustling cosmopolitan towns the Costa Blanca South really has something for everyone. If you are looking for a new build property for sale on the Costa Blanca South please take the time to browse our superb portfolio of brand new properties. If you don't see what you are looking for please use our 'Property Finder' service – If your dream property for sale on the Costa Blanca is out there we will have access to it. Costa Blanca proudly boasts 80 beaches flying the "Blue Flag". The “Blue Flag" is only awarded to beaches meeting the stringent requirement for cleanliness and facilities. In the summer season most of the beaches have a beach bar, perfect to enjoy a morning coffee or a cocktail at sundown. The beaches vary from secluded sand dunes to long flat sandy beaches. We have some superb new build properties for sale within a short walk to the beach, ask us for more information. If you like to do more than soak up the sun there are numerous beautiful marinas across the Costa Blanca which attract the boating enthusiasts, varying in size and facilities offered. There are also endless opportunities for water sports activities including windsurfing, yachting, snorkelling, diving, jet skiing, kite surfing, water-skiing and wakeboarding to name but a few. New Spanish Properties has some wonderful new modern properties for sale in and around these areas, some with stunning marina views. After a hard day on the water why not take a short drive in the Murcia region and relax and unwind in one of the two excellent spa and health resorts offering a wide range of beauty and health treatments. The medicinal mineral waters of these spas are acknowledged by doctors. Just over 3 hours away, the foothills of the Sierra Nevada gradually turn into high mountains. Several ski resorts can be found here and in some places there is enough snow on the higher slopes to ski in spring and autumn. For Golfers, the Costa Blanca South is a veritable paradise. New Spanish Properties have a vast selection of modern brand new golf properties for sale. We have new build villas with frontline golf views, excellent new build golf apartments with equally stunning views. The facilities available on most courses are second to none with excellent pro-shops, bars and commercial centres. If you are looking for a brand new golf property for sale in Spain we would highly recommend that you consider some of our new build properties for sale in Villamartin and La Zenia as these have an excellent location for access to golf courses. If you are looking for new golf property for sale on the Costa Blanca it is important you pick the right location and development, ask our experts. Our website features hundreds of properties for sale on the Costa Blanca, ranging from luxury apartments for sale in Torrevieja to villas for sale in Villamartin, we have property to suit all tastes and budgets. If you can't find your ideal new property for sale in Spain our team of property consultants are on hand to find it for you. Not all properties that we have are listed on the website due to the fast turnaround of the property market so please use our property finder to assist with your search. If you are considering buying new build apartments, new build townhouses, brand new modern villas on the Costa Blanca, Alicante, we invite you to discover our selection of properties for sale.